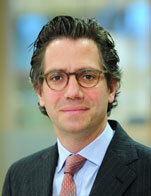 Mr. Christoph Geck-Schlich is responsible for all investments with regards to the fleet expansion of Offen Group. This includes raising equity for the acquisition of vessels and investing in all possible debt and hybrid structures. In February 2016, Mr. Christoph Geck-Schlich also became Managing Director of Crystal Ocean Advisors, a joint venture between NORD/LB, Offen Group and Caplantic, and international service provider for the restructuring and workout of non-performing loans in ship financing. Before joining Offen Group in March 2015, Mr. Geck-Schlich was CIO with Reederei Nord/Oldendorff. He was responsible for various shipping transactions with a total volume in excess of US$ 500m. Before, he worked for Montan Alternative Investment GmbH & Co. KG, an independent asset manager and structuring partner for alternative investments and subsidiary of Komrowski Reederei. From 2000 to 2003, Mr. Christoph Geck-Schlich worked in proprietary trading at Dresdner Kleinwort Wasserstein in Frankfurt and specialized in risk arbitrage and event-driven strategies trading.